The 2010Perseid meteor shower lived up to its promise of a meteor per minute justbefore dawn today, providing an excellent celestial spectacle for people aroundthe globe who had dark and clear skies. 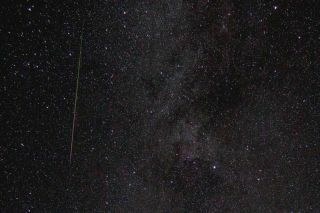 "InIran, the Perseid meteor shower was great," Mohammad Reza Zaman Sani toldSpaceweather.com. Anotherobserver, Anthony in Florida, was one of several who noticed that the meteorssometimes came in bursts. "There would be a few minutes of nothing, then1, 2, 3 in a row," he said, writing (without his last name) on Meteorobs,a website that tracks meteor observations. "We hada nice show in Norway even though the sky was still not completely dark,"said Runar Sandnes on Spaceweather.com. "Meteors came sometimes in showersof 2 or 3." The Perseidmeteor shower is caused by ancient debris left by multiple orbits aroundthe sun of the comet Swift-Tuttle. They name comes from the fact that themeteors appear to emanate from the constellation Perseus, which was highoverhead just before dawn. The meteors all streaked away from that point oforigin, called the radiant. A few non-Perseids, called sporadic meteors, werealso observed on totally different trajectories. "Icounted 20 Perseids in a 20-minute period starting at 4:10 a.m," saidRobert Roy Britt, SPACE.com editor in chief. "Most were faint, but twowere as bright as Jupiter, leaving brief vapor trails that marked theirpath." Jupiterpresided over the annual event, hovering high in the southern sky as thebrightest object in the early morning sky. Brittobserved the shooting stars from reasonably dark skies at the north edge of Phoenix.There were bursts of up to a half dozen meteors in a two-minute period andlulls that lasted up to four minutes, he said. Though neverthe grandest of events, like the 2001Leonid meteor storm, the Perseid shower is known for being reliable, andalso for the occasional bright fireball, or bolide -- an exploding meteor.Other observers reportedfireballs in recent days. The Perseids began in late July, peaked lastnight and this morning, and will continue but tail off over the next severaldays. If youmissed the peak of the shower, late tonight into early Saturday morning offersanother opportunity, experts say. While the number of meteors will drop offsignificantly, a patient observer with dark skies could see several meteors perhour in the predawn Saturday. Those in urban or suburban areas will see farfewer.